Georgia Southern University Diploma Frame - 2001 to Present - Cherry Reverse frame with tassel holder and gold leaf embossing of school name and seal with double mat - Navy on Gold. Diploma size: 11 3/4" x 15" - horizontal. (Approximate overall frame size:25" x 18.5"). Please allow 4-6 business weeks for delivery. **Even though the frames may appear "Out of Stock" on our site, you may still order them. **Note: If you graduated before 2001 please note this on the order as it requires a different frame size (8.5" x 11"). Cherry Reverse frame with gold leaf embossing of school name and seal with double mat - Navy on Gold. Diploma size: 11 3/4" x 15" - horizontal. 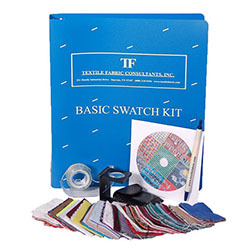 (Approximate overall frame size:21.5" x 18.5") Please allow 4-6 business weeks for delivery. **Even though the frames may appear "Out of Stock" on our site, you may still order them. **Note: If you graduated before 2001 please note this on the order as it requires a different frame size (8.5" x 11"). Mahogany Braid frame with 24K Gold plated Medallion and gold leaf embossing of school name with double mat - with Gold Fillet (adds an elegant look) - Navy Suede on Gold. (Suede mat adds a Rich, Vibrant, Textured Look) Diploma size: 11 3/4" x 15" - horizontal. (Approximate overall frame size:23.5" x 20.5") **Please allow 4-6 business weeks for delivery. **Even though the frames may appear "Out of Stock" on our site, you may still order them. **Note: If you graduated before 2001 please note this on the order as it requires a different frame size (8.5" x 11"). Professional Framing Satin Silver Black Moulding w/Seal in Silver Embassing Black on Silver Mat Georgia Southern University Diploma Frame - 2001 to Present - Silver leaf embossing of school name and seal with double mat. Diploma size: 11 3/4" x 15" - horizontal. (Approximate overall frame size:21 3/4" x 19"). Please allow 3-4 business weeks for delivery. **Even though the frames may appear "Out of Stock" on our site, you may still order them. 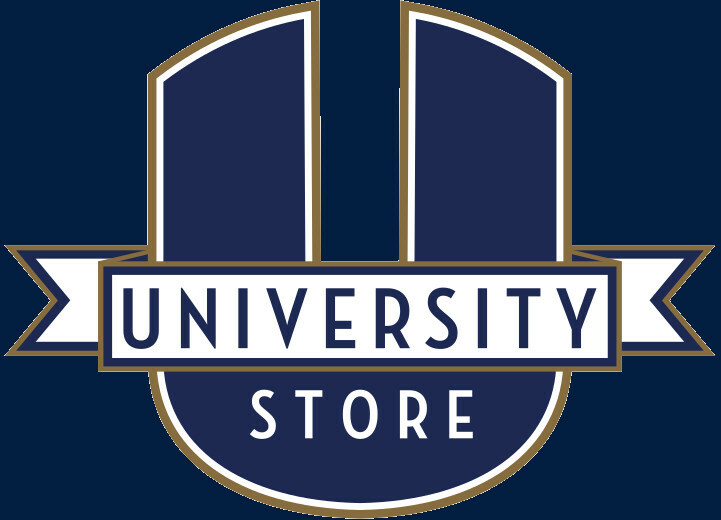 Georgia Southern University Diploma Frame - 2001 to Present - Gold leaf embossing of school name and seal with double mat - Navy Suede on Gold. Diploma size: 11 3/4" x 15" - horizontal. 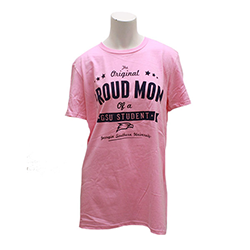 (Approximate overall frame size:22 1/4" x 19 1/4") ***Please allow 3-4 business weeks for delivery. **Even though the frames may appear "Out of Stock" on our site, you may still order them. **Note: If you graduated before 2001 please note this on the order as it requires a different frame size (8.5" x 11"). Professional Framing Vintage Black Scoop w/Seal & Fillet - Navy Suede-11.75x15- Georgia Southern University Diploma Frame - 2001 to Present - Mahogany Braid frame with 24K Gold plated seal and Fillet and gold leaf embossing of school name on Navy Suede mat. Diploma size: 11 3/4" x 15" - horizontal. (Approximate overall frame size:22.5" x 19 3/4"). **Note: If you graduated before 2001 please note this on the order as it requires a different frame size (8.5" x 11"). Rosewood with 3-D Campus Collage with gold leaf embossing of school name with double mat, navy suede* on gold. Diploma size: 11 3/4" x 15" - horizontal. (Approximate overall frame size:22" x 24"). Please allow 4-6 business weeks for delivery. **Even though the frames may appear "Out of Stock" on our site, you may still order them. **Note: If you graduated before 2001 please note this on the order as it requires a different frame size (8.5" x 11"). Georgia Southern University Diploma Frame - Prior to 2001 - Rosewood frame with gold leaf embossing of school name and seal with double mat - Navy on Gold. Diploma size: 11 3/4" x 15" - horizontal. (Approximate overall frame size:22" x 19"). This frame has a single opening for your diploma. Please allow 4-6 business weeks for delivery. **Even though the frames may appear "Out of Stock" on our site, you may still order them. **Note: If you graduated before 2001 please note this on the order as it requires a different frame size (8.5" x 11"). Rosewood with water color with 24k gold plated medallion with school name and double mat, navy suede on gold. Diploma size: 11 3/4" x 15" - horizontal. (Approximate overall frame size:22" x 29 1/2"). Please allow 4-6 business weeks for delivery. **Even though the frames may appear "Out of Stock" on our site, you may still order them. 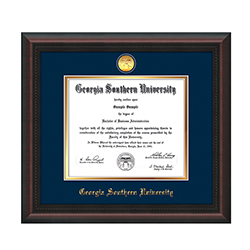 Georgia Southern University Diploma Frame - Rosewood with Gold Lip frame with 24K Gold plated Medallion & Photograph and gold leaf embossing of school name with double mat - Navy Suede on Gold. (Suede mat adds a Rich, Vibrant, Textured Look) Diploma size: 11 3/4" x 15" - horizontal. (Approximate overall frame size:22" x 28"). Please allow 4-6 business weeks for delivery. **Even though the frames may appear "Out of Stock" on our site, you may still order them. **Note: If you graduated before 2001 please note this on the order as it requires a different frame size (8.5" x 11"). Silver engraved medallion. Silver embossed school name. Navy suede and silver matting. Lenox moulding. Made in USA. Silver embossed schoold name. Custome cut navy and off white matting. Logo medallion. Austin moulding.